Transparency Market Research has published a new report titled, “Global Automotive Roof System Market (Type: Panorama Roof System, Sunroof System, Multi-optional Roof System, Solar Roof System, Convertible Roof System, and Plain Roof System; Passenger Vehicle Type: Hatchback, Sedan, Utility Vehicle, Material: Aluminum, Steel, Polycarbonate, and Others, Sales Channel: OEMs and Aftermarket ) - Global Industry Analysis, Size, Share, Growth, Trends, and Forecast 2018 - 2026.” According to the report, the global automotive roof system market is projected to surpass US$ 37 Bn by 2026, expanding at a CAGR of above 5% during the forecast period. According to the report, the global automotive roof system market is likely to be driven by a range of macroeconomic and industry-specific factors. Asia Pacific is expected to be at the forefront of global demand, with the market in the region expanding at a CAGR of more than 5% between 2018 and 2026. Companies such as Webasto Group and Inalfa Roof Systems Group, provide innovative roof systems that offer versatile additional features and have a classic appearance. Automotive manufacturers are also constantly developing their roof systems by providing multiple options for consumers. 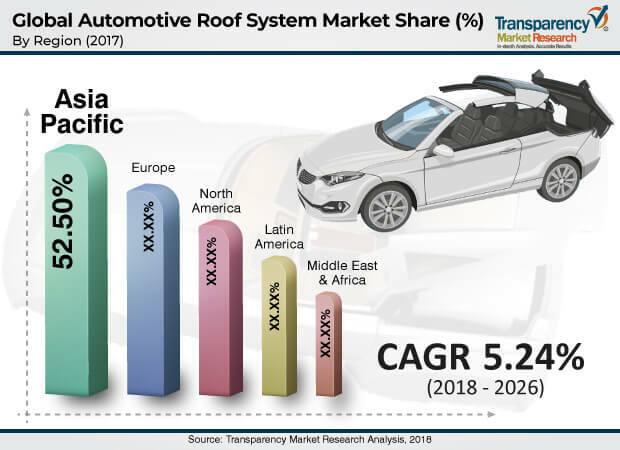 Wide acceptance of convertible roofs and panoramic roof systems by consumers, owing to the comfort offered while driving coupled with extra space, and more air and light, is expected to boost the automotive roof system market during the forecast period. Demand for both hybrid and electric vehicles has been rising across the globe. The major reason is attributed to stringent carbon emission norms being imposed by regulatory authorities worldwide and increasing safety concerns among consumers. The advent of hybrid vehicles is anticipated to offer significant opportunity to solar sunroof manufacturers, as a solar sunroof is highly effective for hybrid vehicles. Various research and development activities are being carried out by leading manufacturers in order to increase production of electric vehicles, which in turn is likely to increase implementation of solar sunroofs considerably in the near future. For example, Toyota has plans to make a solar roof available for the next generation Prius, which is an electrical vehicle. Globally, vehicle production has been increasing for the last five years, due to the increasing usage and demand for passenger vehicle types, thereby driving the global automotive roof system market. In terms of type, the global automotive roof system market has been divided into panorama roof system, sunroof system, multi-optional roof system, solar roof system, convertible roof system and plain roof system. Rise in demand for high-end luxury vehicles across the globe, due to increased demand for more comfortable and esthetically appealing vehicles, is expected to drive the convertible roof system segment of the market. Presently, consumers expect an increasingly high level of comfort in their cars, which is likely to boost the market for convertible vehicles in the region. Based on material, the automotive roof system market has been divided into aluminum, steel, polycarbonate, and other. The body of the vehicle, primarily roof panels, is manufactured from aluminum, which reduces the weight and provides desired properties. The aluminum segment is anticipated to expand, in terms of revenue and volume, as an increasing number of automakers are adopting aluminum alloy roof panels due to their high crash worthiness and weight benefits. In terms of region, the global automotive roof system market has been segregated into North America, Europe, Asia Pacific, Middle East & Africa, and Latin America. Asia Pacific is likely to dominate the automotive roof system market during the forecast period owing to increased demand for luxury vehicles, raised preference for electronically advanced vehicles, and increased adoption of advanced safety technologies and vehicle enrichment accessories. Prominent players operating in the global automotive roof system market include AAS Automotive s.r.o., AISIN SEIKI Co., Ltd., ALUPROF Aluminiumprofile GmbH., BOS Group, CIE Automotive, Covestro AG, GAHH, LLC, Inalfa Roof Systems Group B.V., Inteva Products, JAC Products., Magna International Inc., THE HAARTZ CORPORATION, Valmet Automotive, and Webasto.